No discussion about the top trends of 2017 would be complete without attention to the growing adoption of telemedicine. We’re not the only ones keeping a close eye on what’s happening with new technology that enables doctor’s visits via video. We’ve found some awesome telemedicine infographics that we’d love to share. Pristine is made up of global field organization experts. Their infographic features the global growth of telemedicine, along with the quality of outcomes, geography and technology behind the surging new approach to care. This infographic from Netmotion Wireless gives us a look into the predicted growth in telemedicine, fueled by the Affordable Care Act and telemedicine reimbursement parity laws, which are taking hold across the nation. Although this infographic isn’t specific to telemedicine, it is none the less enlightening. Telemedicine apps are just one of a number of health related mobile applications that are gaining traction with the public. CDW Healthcare brings us this look at several key healthcare IT trends, including the fact that 46% of technology leaders have telemedicine programs in place and another 41% say they’ll have one up and running within five years. The Alliance takes a closer look at four key drivers of the shift to telemedicine. The infographic contains details about reduced costs, improved access to care, a more productive workforce, and a better patient experience. This comprehensive telemedicine infographic from EMI Health takes a more personal look at what you can expect from telemedicine. Notably, they point out that 7,000,000 patients are expected to receive services via telemedicine by 2018. 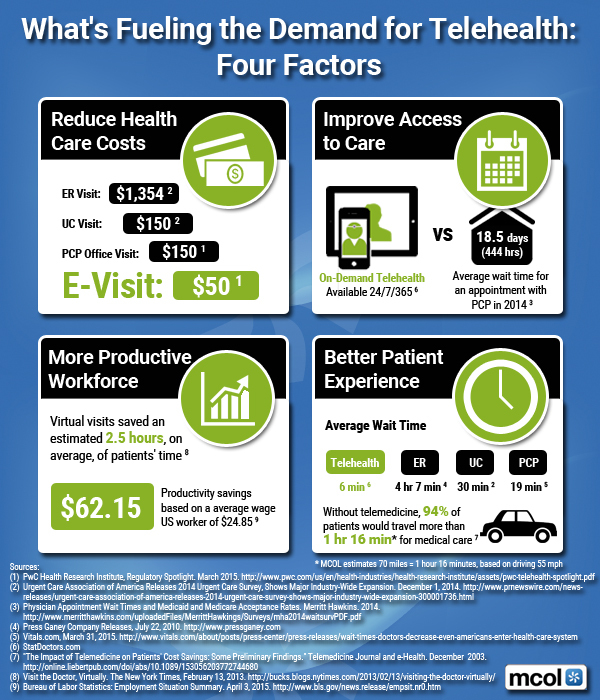 Locatible pulled together a few interesting numbers and outlined the main benefits of telemedicine. Wondering if your state has a law that requires private payers to reimburse telehealth visits at the same rate as in-person visits? Our reimbursement map will tell you in an instant. CDW Health compiled some of the key benefits and market trends for telemedicine. They highlight Frost & Sullivan’s prediction that the number of patients worldwide using telehealth will double between now and 2016. This informative graphic based on a survey of senior healthcare executives by Foley & Lardner LLP, points out that 50% of health care leaders cited quality of care as the primary motivation for implementing telemedicine. InHouse Physicians compiled some key stats for this infographic. They point out that not only are health outcomes almost always as good as with in-person visits, but also 70% of consumers would prefer an online visit to obtain a prescription. The data in these telemedicine infographics makes it clear that more people than ever will receive care via video visits in 2016. Patients are increasingly choosing providers that offer this option, and reimbursement laws and policies are changing to keep up. If you’d like more information on how your practice can take advantage of telemedicine software to grow your practice, increase efficiency, and satisfy patients, just let us know.